Are the fastest growing Heating Solutions business in the UK, and the business was created out of a desire to provide the best products alongside the sort of personal customer service we would like to receive ourselves. They have looked far and wide for the best selection of products to be able to offer. We are really proud to be able to offer their products. Great Rads ethos is ‘would we have our products in our own homes’ This is the first question they consider when adding new and exciting products to the range. All the Great Rads products are exclusively available to purchase through ourselves at Water & Warmth. This entry was posted in News on 15th June 2018 by Jon Pearson. I completely except that 9 times out of 10 the boilers that are being replaced with these newer models are without question, far better products with greater warrantees and way more efficient in terms of running costs and performance. What’s the problem? Isn’t it better to replace my boiler then. More economical in the long run? Why continue with a less efficient model that may end up costing me money? It’s a bit of a nightmare when you call a heating firm in and they tell you that your boiler needs replacing, especially if it’s not very old. Apparently the parts for the boiler are no longer available or it’s beyond economical repair. We have heard this so many times from new customers you just wouldn’t believe it. Unfortunately there are plumbing and heating firms that are taking out boilers that are easy to repair and maintain. The cost for the repair being a lot less than spending out a couple of thousand pounds for a new boiler, and then you have whatever sales techniques they use to “up sell” to make you feel like you’re getting this amazing deal, as they are, of course, doing you a massive favour. We have been asked to carry out a second opinion many times for customers because of lazy tradesman deciding for themselves that a new boiler is the best way forward as a repair simply won’t make them enough money. Or perhaps a more likely reason is…that they just don’t know how to repair the fault! However, the kind of people that can’t be bothered to repair the boiler are also the kind of people that can’t be bothered to fit your new boiler correctly. Who can you trust then? Is it the one-man bands or is it the established firms that have been around for years and years? You would like it to be both!! This entry was posted in News on 27th February 2017 by Jon Pearson. We cover all aspects of domestic and commercial repairs to Gas, LPG and Oil appliances including Maintenance, Servicing and Installations. Free Quotations available for all above works. Water and Warmth Services prides itself on the knowledge and expertise of it’s engineers who have a great deal of experience in all aspects of the plumbing and heating industry. When carrying out any repairs for our customers we feel it important to keep them advised with the progress on the job at hand. It is important that we get any of your plumbing and heating problems resolved as quickly as possible. It is also important that our customers are made aware of any costs before the works are carried out, providing that the parts are available we aim to complete the repair within 24 hrs of our original call out. This entry was posted in News on 22nd February 2017 by Jon Pearson. Millions of UK households don’t have effective heating controls which means they are missing out on huge savings on their heating bills. That’s the view of Bjorn Sejr Nielsen of Danfoss who looks at how modern controls can cut energy costs and the technology driving new developments. Government figures indicate that of the 95% of UK homes with boilers, 800,000 have no heating controls at all and over 70% lack the minimum specified by Building Regulations. The central heating system uses by far the most energy in a typical home and that is reflected in energy bills. The energy saving potential of fitting modern heating controls is supported by research conducted at Salford University’s Energy House. This showed that heating systems with controls cost 40% less to run than those without. It is not surprising, therefore, that heating controls are now recognised as one of the ‘big three’ measures, along with insulation and new boilers, for making a home more energy efficient. Installing and using heating controls correctly ensures that no heat is wasted by keeping some rooms warmer than they need to be. As a result the boiler operates more efficiently and uses less energy to maintain a comfortable temperature where required. Having the heating on for short periods at a time is seen by some as a means of saving money. However, boilers are at their least efficient in the first hour or so of operation so this can be a false economy. As long as suitable controls are installed it can be much more beneficial to leave the heating on for a longer period when it will use less energy to maintain comfortable temperatures. Worcester’s boilers come in gas, propane (LPG), and oil fuel types so you will definitely find a boiler to suit your home. This entry was posted in News on 7th February 2017 by Jon Pearson. 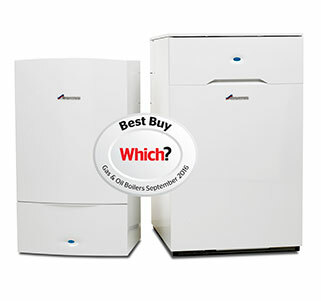 Deciding what boiler is best for you and your home is really very simple. Combination boilers are the most popular choice for the homeowner at present. Most boiler manufactures are offering such good products and guarantees to go with them. Combination boilers are great for the average family home offering hot water on demand and great controls for the heating, from simple time clocks to the smart internet applications. Combination boilers don’t take up a lot of room in the property so can be hidden away without getting in the way. However the Combination boiler isn’t always the best option for everyone, for the larger properties a system boiler with the same high quality and guarantees would be the better choice with a hot water storage cylinder. There are so many ways to control your heating and hot water, not only to make it work the way you want it to, but also in the most efficient way. There are a few thing’s that might also need to be taken into consideration. Getting the best advise is paramount, Water and Warmth has been established since 1991 and has been offering sound professional advise in Plymouth and all surrounding areas that we believe has benefited all our customers. We find that the best way to advise our customers on how to provide heating and hot water is to carry out a site visit and go through the requirements with each individual customer, then advise the best type of system that suits your property and personal needs. We then send out a FREE quotation giving all the details as discussed at the time of visit. There are no hidden costs in any of our quotations. For any more information please don’t hesitate to get in contact with us. This entry was posted in News on 21st April 2016 by Jon Pearson.